I'd say that in the 60s if you wanted to hear those wonderful songs which live on the edge between blues and soul Chicago was the city to go to. This super ballad is right in that bag and I love it. Jack Hyman has a strong flexible baritone voice which gets right to the heart of I Was Wrong, and he's ably supported by some great horn support, particularly from the meandering tenor sax, and excellent organ. 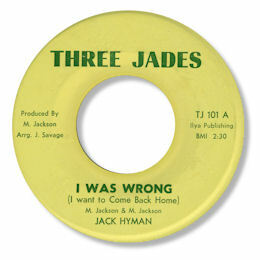 The label Three Jades was owned by Maurice Jackson who produced the record - pity there was no proper B side as this would appear to be the only 45 Hyman ever had releases. The date in the dead wax is 7/17/69.